Much of Tomlin's work from the 1930s was semi-abstract figuration painted in a cubist manner. During the late thirties his forms became softer, influenced by Surrealism. In the 1940s he returned to harder edged forms. By the end of the 40s he was painting pure abstractions of ribbon-like forms and uneven rectangular shapes. Both Tomlin and Gottlieb were one of "The Irascibles" - an ad hoc group of artists who were photographed for Life magazine on November 26, 1950 after they sent a letter to The New York Times objecting to the Metropolitan Museum of Art's choice of jurors for the "American Art Today - 1950" exhibition due to open in December. Excerpts from the letter were published in an article titled "18 Painters Boycott Metropolitan; Charge 'Hostility to Advanced Art'" in the May 22, 1950 issue of The N.Y. Times.The letter, composed mostly by Gottlieb, criticized the jurors for being "notoriously hostile to advanced art." 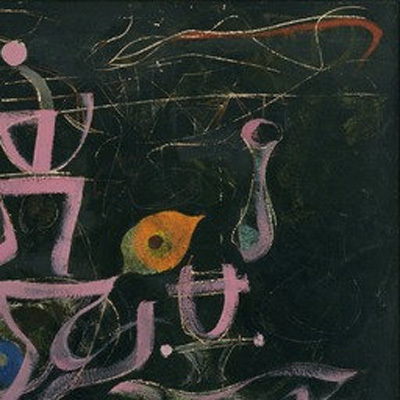 In addition to Tomlin and Gottlieb, sixteen other artists signed the letter including Abstract Expressionists Robert Motherwell, William Baziotes, Barnett Newman, Clyfford Still, Jackson Pollock and Mark Rothko " (Although Rothko's name appeared on the letter, he was actually in Europe at the time. He had left on March 29th for a five month trip after suffering a "breakdown" in New York in 1949. (RO286)) Gottlieb had suggested sending the letter after a three day symposium in April 1950 at Studio 35 organized by Robert Motherwell and Ad Reinhardt which Tomlin attended. The symposium was held to discuss the abstract art movement in New York. Names suggested for the movement at the symposium included Abstract-Expressionist, Abstract-Symbolist and Abstract-Objectionist. Of the artists involved in the yet-to-be named movement Tomlin was probably closest to Robert Motherwell, Jackson Pollock and Philip Guston on a social level. Guston, like Tomlin, had a place in Woodstock in addition to a studio in Manhattan. He [Bradley Walker Tomlin] loved painters and painting. This is the essential fact about him. In everything else, he was a dandy and a dilettante, at great ease in any social circumstance. One would have thought that he was the son of an Anglican bishop or a British general, he had an air - so that it would have surprised none of us if he indeed had been, though I realize now that he was his own construct, from the military moustache to the Brooks Bros. scarf... He liked me, because he regarded me as a gentleman too; but he loved me, as he did Philip Guston and Jackson Pollock, because of a wholehearted and perhaps reckless commitment on our parts - he never understood real despair - to painting, and the acceptance of the existential consequences it brings about in one's life. Guston, Pollock, and I were a generation younger, all reared in California... the three of us filled with a self-torment and an anxiety that was alien to Tomlin, but to which he must have deeply responded, to have loved us so much in turn... I have only known two painting milieus well personally, the Parisian Surrealists, with whom I began painting seriously in New York in 1940, and the native movement that developed in New York that has come to be known as "Abstract Expressionism," but which genetically would have been more properly called "Abstract Surrealism" - the first exhibition quarters of the movement were Peggy Guggengeim's "Art of This Century," which otherwise was a museum of abstract and surrealist art. Mondrian and Léger were also in New York, where Mondrian was to die in 1944; but it was the influence of the European Surrealists - with Joseph Cornell, David Hare, Noguchi, myself, and a little later, Gorky, as transmission agents - that acted as the catalyst for the explosion of "Abstract Expressionism."